We have launched a new Product for Seth Apter - Baked Texture. We still have 1 reveal left for January 1st so stay tuned. Pam here today sharing with you my "Peace" Card using lot of Emerald Creeks Supplies FABULOUS products! Isn't that something to look forward to for 2018. Just as a deer pants in the woods for water... he looks always for peace and for his hearts desire! I hope you are inspired by my "Peace" Card to create a few for yourself as you go into 2018. To enter this month's Happy Holiday's Dare, use the link below. Remember to follow the challenge rules as posted on the right sidebar of the blog, in order to be eligible. Joyeux Noel - Merry Christmas, dear Emerald Creek friends! Believe it or not - I really made some Christmas cards. Me! And this time they didn't land in the bin - which I guess is mainly because of the beautiful digis from Altered Pages - whom Emerald Creek has been teaming up with during the last weeks - and Kim's wonderful embossing enamels! I hope you like them too! To enter this month's Fireworks & Sparks Dare, use the InLinkz below. Remember to follow the challenge rules as posted on the right sidebar of the blog, in order to be eligible. Seth Apter has been an absolute joy and delight to work with as we perfected his Newest product line. I am so honoured and delighted that he selected me to work with him in launching his new product line. I can't even express how fun this has been. We have worked together passing photos, ideas and mail to created something truly unique and unmatched in the industry. These mediums are going to be a game changer for artists. The simple to use embossing powder applies easily and activates with heat for an absolutely captivating and mind blowing texture. And these powders can be applied with adhesives and left 'unbaked' for gritty, mat textures that are simply fun. Launching January 20th, 2018 at the Creativation event, these demos will surely be something you won't want to miss out on. We have created these to capture not only Mixed Media Artists and Paper Craft Artists, but also for fine Artists looking for a little texture and pop to their creations. The first person to have these in their hands will be one winner from the Creative Scrapbooker 12 Days of Christmas, with our prize pack being featured today; Day 7, Dec 18, 2017. The Seth Apter Powders were so new in fact that we were still designing the packaging at the time of prize submittal, so this set will truly be 1 of a kind! 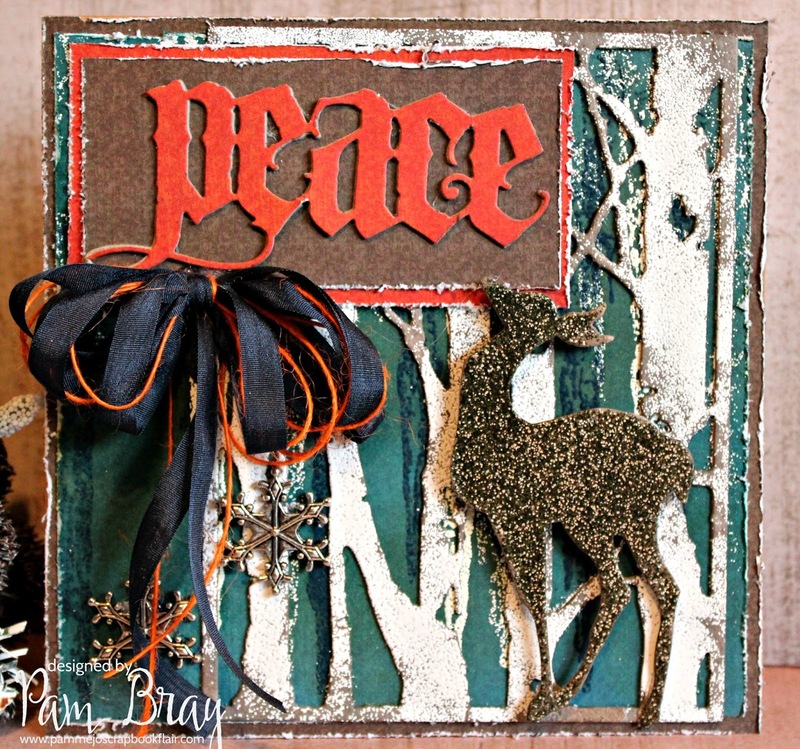 Play along at the Creative Scrapbooker 12 Days of Giving by clicking here! Also, we will be emailing all of the retail stores with a special pre-order opportunity, to ensure all of you are ready to sell your hottest product - Baked Texture - by January 20th. 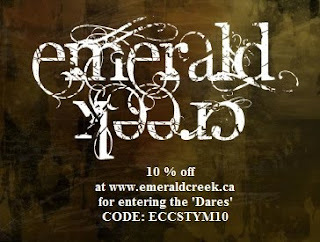 the order window is short so make sure you are on the email list. TOMORROW we have an exciting announcement! (We couldn't contain it until January 1st LOL). These little elves just want to dash off in this miniature sleigh! I love anything vintage or vintage inspired and this little slight fits the bill. 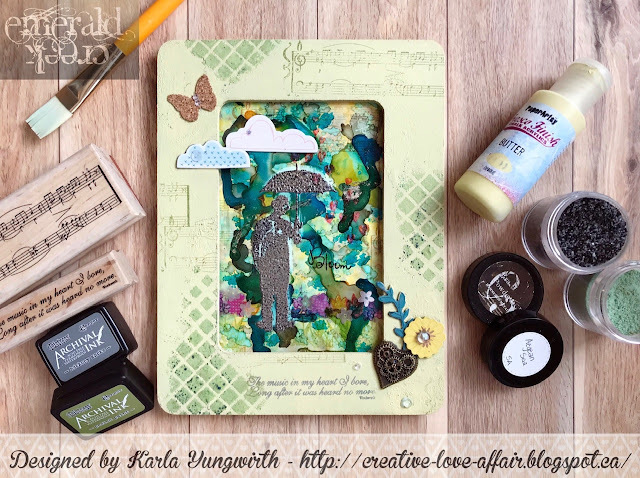 I am so thrilled to be joining with StencilGirl to inspire all of you! First, I want to send a thank you to the whole team, especially Mary C. Nasser who organised this and led me through my first major blog hop. Join the hop, follow along every day and comment on all of the blogs for your chance to win! First I headed out to Michael's for hopefully a round canvas, instead I came away with this sweet wood board on a major sale! I needed to make a test piece so I didn't screw up, and chose a piece of 12x12 superstock from Creative Scrapbooker magazine. I picked out some stamps, Memory, Wired, Take 2, Eldergrove, and tree pieces from the Gone Fishin stamp. Next up is a stencil from stencil girl and and I knew the Seth Apter's Timeless Stencil. I actually picked the stencil first and then the dilapidated building was the perfect stamp. 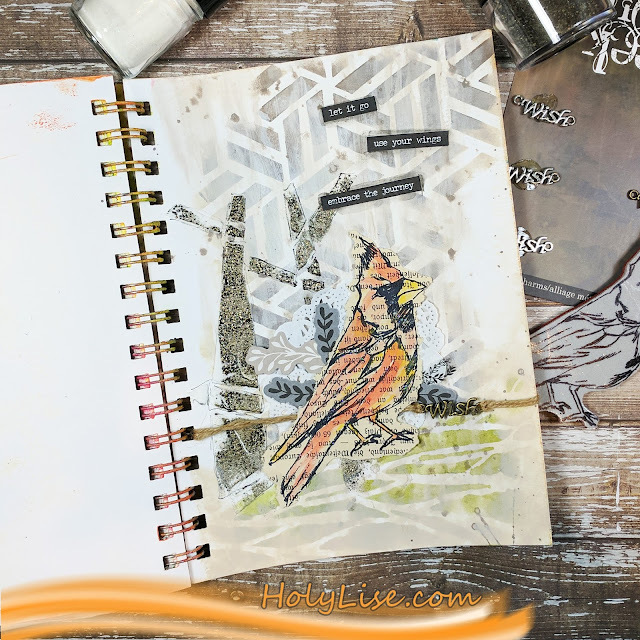 Add the 9x12 Barb Wire Stencil by Mary Beth Shaw and the 9x12 Chicago Stencil by Nathalie Kalbach and the pieces are selected. I began stamping the board and using Distress Grit texture paste for the TIMELESS. I coloured with a direct to board technique for maximum colour. Then I added Wendy Vecchi's Cornflower Mica spray in lieu of water, for a beautiful night sky shimmer. Next I went back to the grit paste and pasted pieces of the barbed wire all around the image and dried with a heat tool. I place the stencil back over the dried paste and used my Ranger Emboss it Dabber to apply the clear in for the Burnt Copper Leaves embossing powder to stick too, heated it in sections until I had melted this fabulous powder over everything. I felt like the Chicago Stencil had a bit of the trendy window effect but I didn't want to compromise the wood texture and varied colours. So I used Crackle paste, sprinkled a like and random dusting of Fractured Ice Embossing powder and allowed to dry. Once it fulled dried and crackled, I then heated it adding a slight colouring and helping the embossing powder to maintain the same cracked effect. The project felt a little flat and 1 dimensional. I used my poinsettia die from Tim Holtz & Sizzix to whip up some brown paper flowers from a natural paper I received a decade or more ago from Vicki and I selected the copper Flower Crest brads for my middles. I inked with brushed corduroy, spritzed with water, dried with a heat tool and then used my hot glue gun to shape the petals up against the brad giving a low profile dimension. I really, REALLY wanted to add Christmas lights to my dilapidated house, but i didn't want to risk my post for an epic fail. now that I was done, I was ready to see if I would like the lights. Now all I could remind myself was I have done this a million times at work, and I don't need to worry. I measured the correct size for the bulbs to have a snug fit. ✔ we are all good.